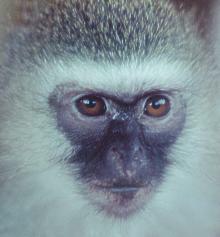 IN 1992 , I became involved with the rehabilitation of infant Vervet monkeys in KZN. South Africa. cats, she came up to me, patted me on the leg and held her baby out for me to see. I did the same. Rodney was watching all this from an upstairs window. When Bugs was approximately a year old, a second baby, 'Bullet' arrived. A local sugar farmer had shot her mother. When asked why he did this he replied, “Because she was there!”. Bullet was only an hour or two old. She sustained injuries from the shotgun pellets that killed her mother. One of these pieces of metal lodged in her head and had to remain there, as it was too dangerous to remove. It was very touching to see how Bugs adopted Bullet when we brought her home from the vet, a truly remarkable sight! These two monkeys lived happily together, totally free and mixing with the wild troop who continued to visit us regularly. Then came the time for Bugs to move on. She reached maturity, found a mate and returned permanently to the wild. A very sad time in a way, but it was what was best for her and what we had worked for. Bullet was lonely, but she had the company of the wild youngsters who were a wee bit younger than her. 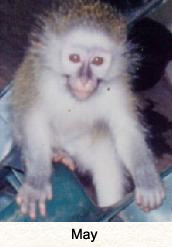 Because of her injury she was ‘slower’ than a normal monkey of her age. Much to our delight Bugs reappeared with her troop approximately eight months later with a baby. 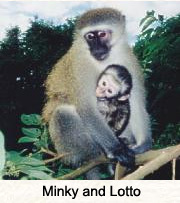 She had become a wild monkey and had been fully accepted into the resident troop and visits at regular intervals! Over time more and more casualties arrived and departed. Through word of mouth people got to know about us and soon we were being called for help and advice, rescue of sick and injured Vervets and educational talks at schools and in local communities. All this work has been done with our own funds and a few donations. Fortunately, we have built a network of friends and associates - kind people who help make a difference, offering veterinary services, food, hands-on help and moral support.  We have been able to purchase an acre of virgin bush adjacent to our home and extend the sanctuary. The monkeys are our prime concern. 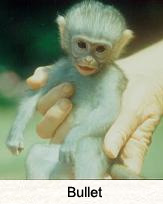 Our greatest wish is to be able to expand and help more of these now endangered creatures return to their natural habitat and areas, to rehabilitate troops to areas where they once roamed, to eradicate the senseless cruelty we see daily and to educate people of all age groups to help them understand and protect their natural heritage before it is lost for all time.